"An education system corresponding to our needs and open to all, rich or poor, urban or rural dwellers, is vital to our economic progress and the gradual increase in our standard of living" (translation). "Education? Not too much! Our ancestors bequeathed us a heritage of poverty and ignorance and it would be tantamount to betrayal to educate our people" (translation). These words were spoken by Antoine Rivard, lawyer, Union nationale MLA and Solicitor General of Quebec from 1950 to 1959. His leader, Maurice Duplessis, also had a strange concept of "education." He "likened it to alcohol", and "some people can't hold their liquor" (translation). For years, these two men and other Union nationale MLAs declared that Quebec had the best education system in the world. Yet, at the dawning of the 1960s, data far from corroborated this pompous assertion. Indeed, half of youths aged 15 to 19 no longer attended school. This generation mirrored earlier generations: in 1962, 54% of adults aged 25 had no education beyond the sixth grade. In 1961, Black Americans aged 25 to 29 averaged an additional year of schooling compared to French Canadians of the same age group. And as if this were not enough, the education system in Quebec was underequipped and its teaching staff – comprised primarily of religious community members --, was completely overwhelmed and running out of steam. In short, the situation was close to catastrophic, even more so since the job market was looking for specialized labour. A complete policy change was required. 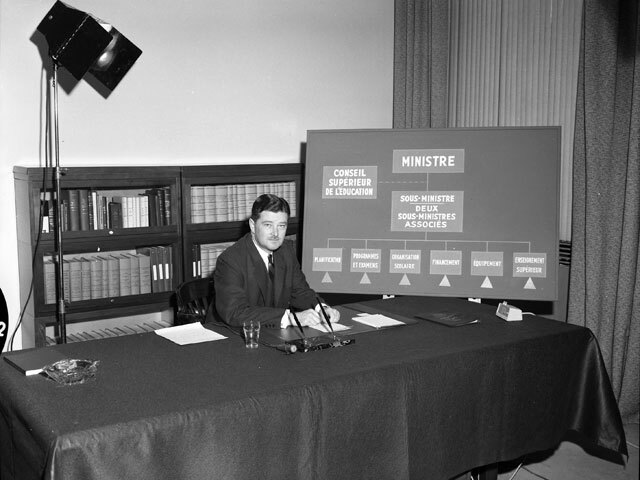 When they came to power in 1960, the Liberal government and Paul Gérin-Lajoie, Minister of Education, introduced a comprehensive education chart, a group of measures to improve education and make it accessible to one and all, without exception. Upon the recommendation of the Parent Commission, a Ministry of Education was created. Education immediately became a responsibility of the state and the clergy lost is prerogatives in the field at all levels, from elementary school to university. Like people elsewhere in the Western World, but with a time-lag of a couple of decades, the population in Quebec began to believe in the power of Instruction. As a sign of the times, the new leitmotif became '"Qui s'instruit, s'enrichit" (education for a brighter future). And results were not long in coming. 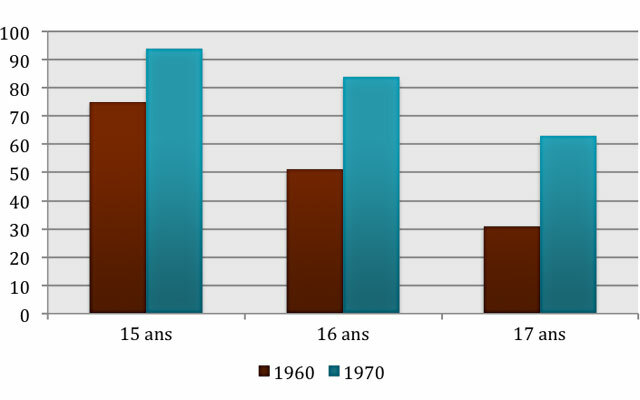 At the high school level, school attendance increased significantly from 1960 to 1970, in particular among youths aged 15, 16 and 17 (see graph). 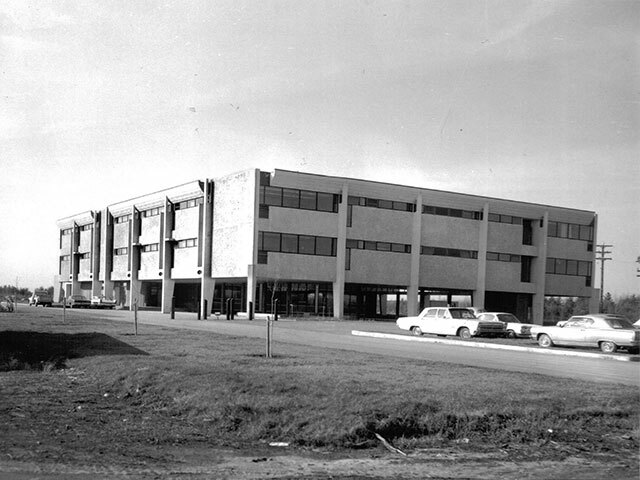 Post-secondary registrations exceeded 136 000 in 1970, compared to 58 000 ten years earlier. 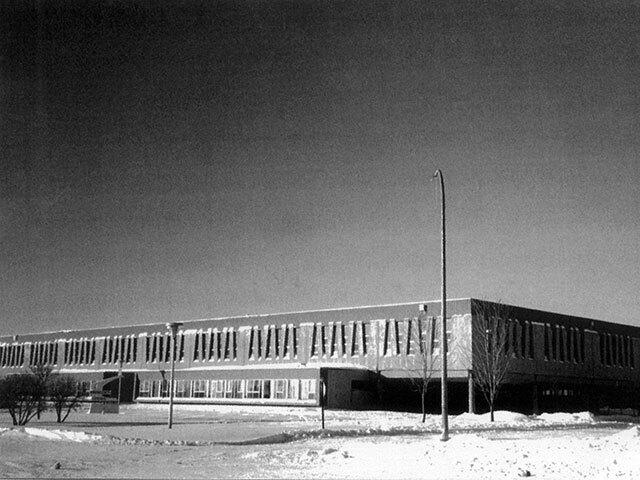 Source: Kenneth McRoberts and Dale Posgate, Développement et modernisation du Québec (Development and Modernization of Quebec) Montréal, Boréal Express, 1983, p. 75. In the end, the emergence of the Ministry of Education, which translated into the democratization of education, might be considered a cardinal theme of the Quiet Revolution.